As part of their book tour for The Devil’s Game, I have authors S. L. Pierce and Maren Kaye here today to talk about the setting of their book. Do you have a favorite city? A place you have been or that you’ve dreamed of going? I believe most people do. I do. My favorite is Chicago. I’ve only been twice, but both times were fantastic. I lived near San Francisco and I wonder if being able to see it anytime I wanted to took some of the shine away. Would I feel the same way if I lived near Chicago? I don’t think so but you never know. Let us introduce ourselves; S.L. Pierce and Maren Kaye. We are the authors of a psychological thriller, The Devil’s Game. Maren and I took a little different approach when writing this book. We didn’t specify the city in which the story takes place. We leave it to you to imagine your favorite city. Maybe our main character, Rachel’s favorite coffee place is just like that cool one you went to on that one trip to Seattle with your girlfriends. Or maybe her apartment is like the one your sister lived in when she was in college and your parents let you go on your first trip alone to visit her. Or maybe we just didn’t want to ruin a great city with this chilling story. A stalker? A psycho? Not in my Chicago! Not in my Seattle! And I certainly do not want to imagine a scenario as twisted as a stalker stalking a stalker. That’s right. A stalker with a stalker. Is that even possible? Doesn’t that make the stalker my friend? 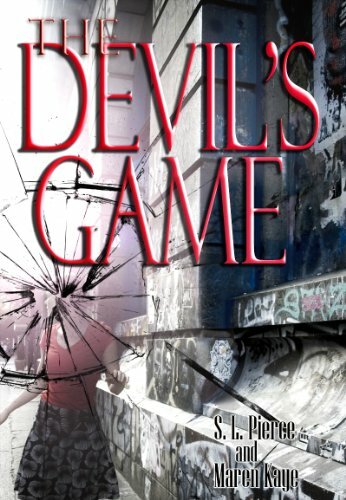 Like the enemy of my enemy…I suppose you will just have to read The Devil’s Game to find out. A book set in a city that is never named? That sounds very intriguing. Is a stranger who stalks your stalker a friend or your worst enemy? Rachel Pendelton is determined to break from her small town past and stake out a new life for herself with a dream job in the big city. But hard work and determination are no match for whoever is working against her. When anonymous gifts show up, she’s flattered. When they appear in her locked apartment, she starts worrying. What can she do when everyone she turns to for help looks suspicious? What she doesn’t know is that a game has begun. A game with rules as baffling as they are deadly. A game that will pit her against the criminally insane. And only one can finish alive. Read the first 10 chapters online at Goodreads or Kindle Boards. I have an ebook copy (Amazon or Smashwords) to give to one lucky reader. To enter, simply leave a comment stating your favourite city, whether you’ve visited it before or not. Be sure to include your email address so I can notify you if you win. Giveaway is open worldwide until midnight (EST) August 30, 2011. Follow the tour for THE DEVIL’S GAME! I have a number of favorite cities. I love Savannah, GA. It is everything the old south should be, great squares with parks, great old homes (you can tour), great riverfront walk, love it. I also love Chicago, I've only been there once but it is on my gonna go back to list. I'm a huge fan of the southwest so Sante Fe NM is also way up there. My favorite city is San Francisco. I have not visited it in several years, but I have such fond memories of the times that I have spent there. I have to say my favorite town is Reno, NV. I just love being this close to the mountains and still have access to all the events in town. I have to say I love San Francisco. I love the memories of that city and the multicultural neighborhoods, good food, shops, and delights. Thank you for the awesome giveaway opportunity. I have been haunting this tour and would love to read the book. My favourite city that I have visited would have to be Havana in Cuba. I love the old-world charm of the city, and the architecture is just gorgeous! I'd love to read this book! Please enter me in the draw. I think my favorite city is Prague, never been, but it is one of the places I'd most want to see. It always sounds romantic and moody and mysterious. That's a tough one – I've always felt “at home” in Bozeman, MT, but I also lived in Portland, OR for almost 3 years and it's a beautiful city that I really love … so, I'd say it's a tie. My favorite City is Toronto. I am assuming this as I've never visited. But I haven't visited a shocking amount of cities, hardly stepping outside of Brooklyn my whole life. If I could, I would go to Toronto in a minute. I love the idea of a story that takes place in a nameless city. It opens it up and gives the reader a better chance to make it personal to their own experiences, as you said. I just love that idea. Any of the southern big cities are a favorite of mine. New Orleans, Atlanta, Savannah, Charleston, Myrtle Beach, Raleigh, Charlotte, are all full of that southern charm but have a much seedier underbelly. I've visited all of these and would do so again. My favorite city would have to be Seattle, Washington. I loved it there. And it doesn't rain as often as people make it out to! I visited there when I went to interview for undergrad at Seattle U. Best week ever.